Micro-Tools are the smallest available precision instruments for laboratory and production use. Micro-Tools with interchangeable tips are available in hardened tool steel, stainless steel, and carbide for the cutting tools. 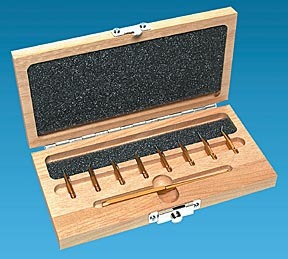 Dedicated precision handles for each type of the Micro-Tools are available. The tool handles have a practical hexagonal shape to prevent rolling of a flat surface. 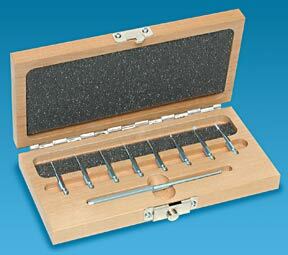 Micro-Tools are available in 32 different tip configurations mounted in an interchangeable tool base. Many Micro-Tools with interchangeable tips are also available with shank sizes ranging from 0.025 to 1.0mm (0.001" to 0.040"). Applications for these precision Micro-Tools extend to microscopy, specimen preparation and manipulation, micro-biology, micro-electronics, forensics and spectroscopy. All tools are especially useful for precision tasks involving probing, manipulating, marking, cutting, assembling and separating on a microscopic level. 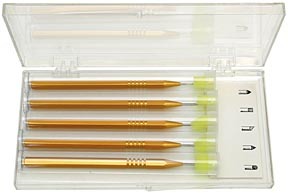 Based on the design and craftsmanship used to manufacture the Micro-Tools there are also Small Precision Tools available with integrated handles and a fixed shank diameter (most 0.8mm). 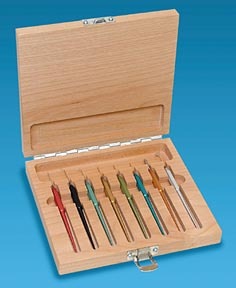 The small precision tools mostly come in sets and deliver excellent value for less demanding applications.